Switchable Single Sideband Suppressed Carrier (SSBSC) technology for potential reduction of multipath is a standard feature. 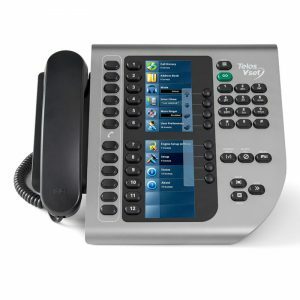 A front panel touch screen GUI, on a 10.5″ diagonal screen, provides ease of use and enhanced metering and diagnostics. Remote access is available via any web browser. 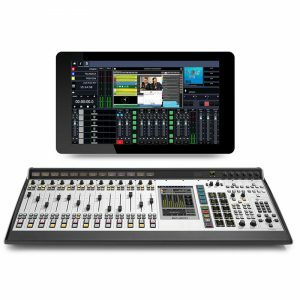 Livewire, AES/EBU digital and analog I/O are standard. Fanless cooling. Rugged 4 RU chassis. Omnia.11s now ship with the G-Force Dynamics Engine standard. G-Force is also available as an optional Plug-In for Omnia.11 units already in the field. Designed by Frank Foti and Cornelius Gould, Omnia.11 with G-Force represents a significant update to Omnia.11’s dynamics—so significant, in fact, that Omnia has updated the GUI to a vivid cobalt blue. It sounds even better than it looks thanks to a dynamics processing framework that enables the Omnia.11 to set the overall EQ for signature consistency, making it sound cleaner, clearer, louder, more consistent, more open, and more pleasing. You hear the music. You hear the voice. You don’t hear the processor. Both FM+HD and FM-only models can be upgraded with the optional Perfect Declipper Plug-In, a revolutionary new algorithm engineered by audio-processing legend Hans van Zutphen that restores clipped areas in audio recordings. This algorithm not only restores dynamics, but removes distortion. The G-Force Plug-In (which ships standard on all new Omnia.11 units and can be added as an optional upgrade for existing units in the field) enables Omnia.11 to handle rapidly changing, hyper-compressed source material better than ever with new, sophisticated improvements. The G-Force dynamics processing framework lets the Omnia.11 set the overall EQ for signature consistency, making it sound cleaner, clearer, louder, more consistent, more open, and more pleasing. You hear the music. You hear the voice. You don’t hear the processor. For deep, tight bass that you can feel! To gain that extra db of loudness. Self-adjusting attack/release functions guarantee crystal clear music and voice. The limiters are self-adapting and can tune themselves to the activity of the AGC section on the fly, providing more powerful and transparent limiter action than possible before. Makes adjustment of limiters a breeze! Manages harmonics for a natural and undistorted bottom end. Dramatically reduces intermodulation distortion (IMD) for more loudness headroom. Output of the Omnia.11’s stereo generator can be coupled directly to the modulator of the transmitter’s exciter. This enables the exciter to modulate with more precision and clarity. Omnia.11 Single Sideband Suppressed Carrier (SSBSC) technology may reduce multipath distortion. 10.5″ diagonal screen clearly shows all controls. Military-grade, fanless industrial design stays cool with heatsinks in rugged chassis. Non-linear Crosstalk: > -80 dB, main to sub or sub to main channel (referenced to 100% modulation). 38 kHz Suppression: > 70 dB (referenced to 100% modulation). 76 kHz Suppression: > 80 dB (referenced to 100% modulation). Pilot Protection: > -65 dB relative to 9% pilot injection, ± 1 kHz. 57 kHz (RDS/RBDS) Protection: better than -50 dB. Maximum Load Capacitance: 5nF (at 10 ohms source impedance). Maximum cable length: 100 feet/30 meters RG-58A/U. Input impedance 10k ohms resistive. Maximum Input Level: +22 dBu. Nominal Input Level: +4dBu, which nets a -18dBFS input meterreading on a steady-state signal when the Input Gain controlis set to 0.0dB. Program material with a nominal average level(VU reading) of +4dBu will typically produce peak readings on the input meter in the range of -12 dBFS to -6dBFS. This is the correct operating level. Crystal Semiconductor CS5361, 24 bit 128x over-sampled delta-sigma converter with linear-phase anti-aliasing filter. Pre-ADCanti-alias filter, with high-pass filter at <10 Hz. Minimum load Impedance: 600 ohms. Output Level adjustable from -2 dBu to +22dBu peak in 0.1dB steps. Crystal Semiconductor CS4391, 24 bit, 128x oversampled. Complies with the standard 50 or 75 microsecond pre-emphasis curve within ± 0.5 dB, 30 Hz to 15 kHz. 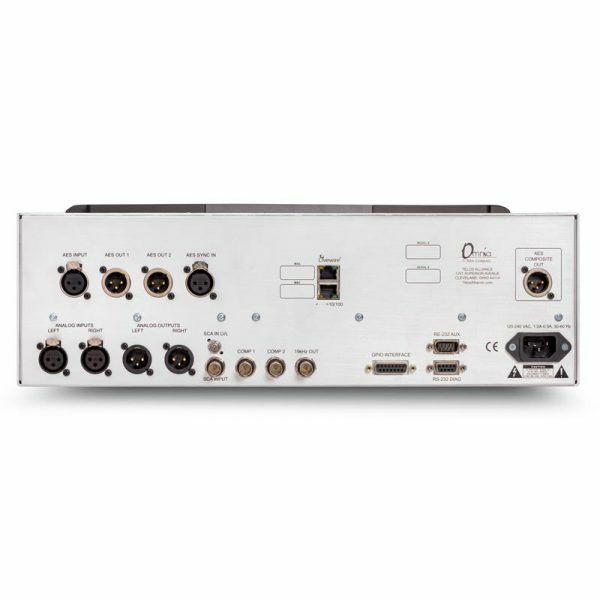 The analog left/right output and AES/EBU Digital outputs can be configured for flat or pre- emphasized output. Less than 0.01% THD, 20 Hz – 7.5 kHz. Second harmonic distortion above 7.5 kHz is not audible in the FM system. Signal-Noise Ratio: > -80 dB de-emphasized, 20 Hz – -15 kHz bandwidth, referenced to 100% modulation. The measured noise floor will depend upon the settings of the Input and Output Gain controls and is primarily governed by dynamic range of the Crystal Semiconductor CS5361 A/D Converter which is specified as >110 dB. The dynamic range of the internal digital signal processing chain is >144 dB. Greater than 65 dB, 20 Hz – -15 kHz; 70 dB typical. > -70 dB, 20 Hz — 15 kHz. 36ms. “FM” channel, as measured from the analog inputs through the composite MPX output. Source Impedance: 5 ohms or 75 ohms, jumper-selectable. Single ended and floating over chassis ground. Output Level: 0V to 10V in 0.05V steps, software adjustable. Texas Instruments/Burr Brown PCM1798, 24-bit sigma-delta converter. Two electrically independent outputs. Software based level adjustment. 50 ohms or greater load is suggested. Adjustable from 4.0% to 12.0% in 0.1% steps and OFF. 19 kHz, ± 0.5 Hz. -85 dB typical, 75 μs de-emphasized, 15 kHz bandwidth, referenced to 100% modulation). < 0.02% THD 20 Hz – 15 kHz bandwidth, 75 μs de-emphasized, referenced to 100% modulation. Stereo Separation: > 65 dB, 30 Hz – 15 kHz. Linear Crosstalk: > -80 dB, main to sub or sub to main channel, referenced to 100% modulation. XLR-female, EMI-suppressed. Pin 1 chassis ground, Pin 2-3 transformer isolated, balanced, and floating. Standard AES3 specified balanced 110 ohm input impedance. 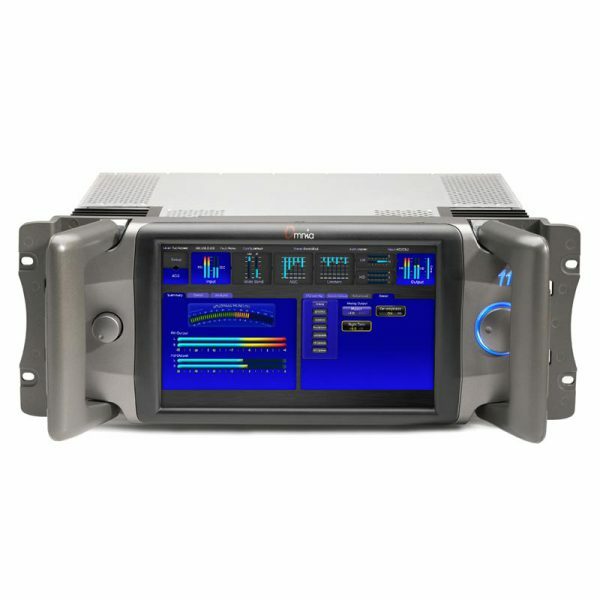 Automatically accepts sample rates between 32kHz and 96kHz. Connector: XLR-female, EMI- suppressed. Pin 1 chassis ground, pins 2 and 3 transformer isolated, balanced, and floating – AES3 standard 110 ohm impedance. Via Ethernet using built-in Java (TM) based remote control program integrated into web page interface. All software is served from the built-in web server to any standard web browser; there is nothing to install on the user’s computer. Ethernet – Industry standard EMI-suppressed RJ-45 connector. Connector: EMI suppressed DB-15 female connector. Voltage: 100-250 VAC, 47-63 Hz. EMI suppressed IEC male. Detachable 3-wire power cords supplied for US and European use. Internal. Overvoltage and short circuit protected. 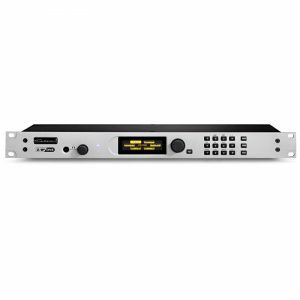 Configuration: Stereo per AES/EBU standard, CS8420 Digital Audio Transceiver with 24 bit resolution, software selection of stereo, mono from left, mono from right or mono from sum. 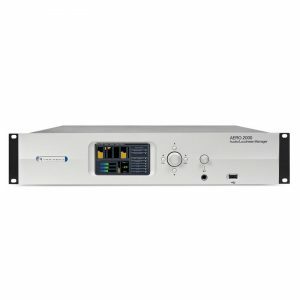 Automatically accepts and locks to input sample rates between 30 and 108 kHz. Connector: XLR-female, EMI-suppressed. Pin 1 chassis ground, pins 2 and 3 transformer isolated, balanced, and floating – AES3 standard 110 ohm impedance. Stereo per AES3 standard. Output can be configured in software for flat or pre-emphasized response at 50 or 75 microseconds. 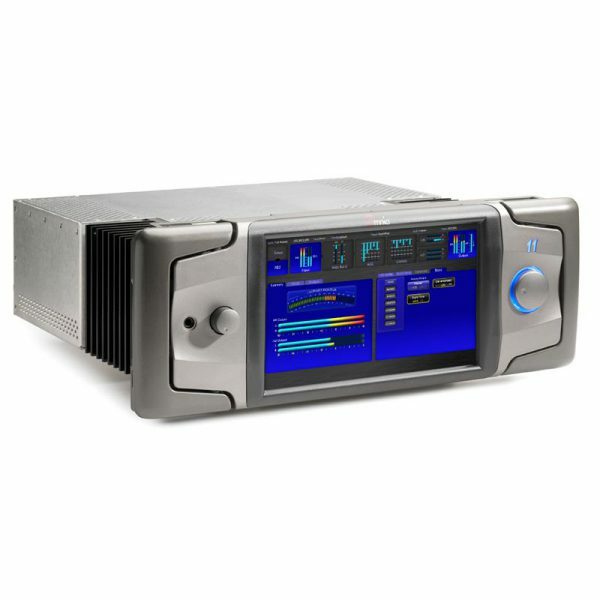 Digital Sample Rates: Output sample rates software selectable for 48kHz, Sync to Input or Sync to External. Connector: XLR-male, EMI-suppressed. Pin 1 chassis ground, pins 2 and 3 transformer isolated, balanced, and floating. Standard AES3 specified 110 ohm source impedance. Digital Output Level: -22.0 to 0.0 dBFS software adjustable. Stereo per AES3 standard. Output can be configured in software for flat pre-emphasized response at 50 or 75 microseconds. Digital Sample Rates: Output sample rates software selectable for 48kHz, 44.1kHz or Sync to External.